The European Commission (Commission) has granted a temporary and conditional exemption in the Greater London Urban Area from the European Union’s air quality standards for dangerous airborne particles known as PM10. The Commission considers there may be a risk of the PM10 daily limit value being exceeded after the exemption period ending on 11 June 2011. The time extension reapplication to comply with the PM10 daily limit value in London has therefore been granted on the condition that short-term measures are introduced to control, or, where necessary, suspend activities which contribute to the risk of the limit values being exceeded. In other words: no new short-term air quality measures; no time extension. With the Mayor having postponed systematic long-term measures, such as Phase 3 of the London low emission zone (which could have provided a margin of safety to avoid the need for short-term measures), this new plan could include measures in relation to traffic (e.g. local bans for the dirtiest vehicles when pollution is worst), construction work, ships at berth and the use of industrial plants or products and domestic heating. The UK should ensure that those measures or, if appropriate, a short-term action plan within the meaning of Article 24 of Directive 2008/50/EC (Air Quality Directive) are in place by 11 June 2011 at the latest and shall communicate them to the Commission by 30 November 2011. Further, by ‘freezing’ not cancelling, the current infringement process for breaches of the PM10 limit values in London since 2005 (which has already passed the final written warning stage), the Commission remains able to refer the UK to the European Court of Justice if the conditions of the exemption are not met. A reference to the European Court of Justice could therefore take place in the months leading up to the London 2012 Olympics. In any event, the UK must comply fully with the PM10 annual mean and daily limit values throughout London (and the rest of the UK) in 2011 and thereafter. It must do so irrespective of weather conditions, trans-boundary air pollution, street geometry or other factors that have been used as excuses in the past. The Air Quality Directive gave Member States the chance to apply for a time extension until 2011 to comply with the PM10 limit values. This has meant no-one has been sure from when the limit values would apply. That uncertainty is removed by today’s announcement as no further time extension applications are allowed. The Commission’s requirement for immediate action by the Mayor and the Government means that public health will be protected to the maximum extent enforceable by law. The Commission has found a way to require action by the Government and the Mayor now rather than grab a headline (e.g. by rejecting unconditionally the time extension reapplication for PM10) but lose months or years while an enforcement case works its way to the European Court of Justice. The Commission remains able to refer the UK to the European Court of Justice if the conditions of the exemption are not met (i.e. move from Stage 2 to Stage 3 of enforcement process (with fines occurring at Stage 6)). In contrast, if an unconditional time extension had been granted, some four years of legal pressure would have been lost (since the original first written warning was in January 2009 and the next would be in October 2012 or later i.e. shortly after ratified data for 2011 is reported). Separately and together, this means there is no let-up in the pressure on the UK to comply with the PM10 limit values in London. Any breach of the PM10 annual mean or daily limit values in London (or elsewhere in the UK) in 2011 or thereafter will be unlawful. This should make it easier for the Commission to progress quickly through the six stage enforcement process and seek unlimited lump sum and daily fines for persistent offending. These fines might total £300 million per year per pollutant. The Mayor’s Air Quality Strategy (AQS) says that road transport is the dominant source of PM10 emissions in central London, contributing around 79% in 2008, 80% in 2011 and 75% in 2015 (paragraph 2.5.3 on page 38). The AQS estimates that road transport is the main source of PM2.5 emissions in London, contributing around 80% in 2008, with a slightly lower proportion in 2015 (see paragraph 2.5.6 on page 41). A health study published by the Mayor estimated that some 4,267 premature deaths in London in 2008 were attributable to long-term exposure to PM2.5 (with each such person dying up to 11 ½ years early). This was nearly one in 12 of all deaths recorded in London in that year. “The Mayor has stumbled and fallen after backward steps on air quality measures. This is a ‘wake-up call’ to the Mayor and the so-called ‘greenest Government’ in the run-up to the London 2012 Olympics. 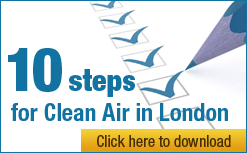 “Clean Air in London (CAL) hails the European Commission’s (Commission’s) temporary and conditional exemption as an ideal mechanism to maximise pressure on the UK to comply with health based laws. It requires urgent air quality action in London and cleverly ‘freezes’ the current enforcement process for several months. Even now fines are not inevitable if the Mayor and the Government take urgent action to improve London’s air quality. It is a scandal that they have ignored for years common sense, their duties and the calls of Londoners for them to take action. “The UK has not deserved a time extension to comply with the daily limit value for dangerous airborne particles (PM10) in London. It failed to comply with the pre-conditions or show convincingly how the legal standard will be achieved throughout London in 2011 – for example at Horn Lane in Ealing. It is clear the Commission was not satisfied with the UK’s reapplication for a time extension. viii. ignored the trend so far this year, even at the Government’s preferred monitoring station in Marylebone Road, which has shown 15 exceedances of the PM10 daily limit value (out of 35 allowed for a whole year) compared to just nine by the same time last year. “The UK looks set to try to hide the facts further as part of its five yearly review of monitoring stations this year. The UK also continues to keep secret information requested by CAL over two years ago under the Freedom of Information Act. CAL is therefore calling on Parliament’s Environmental Audit Committee to investigate whether the UK is acting in good faith on air quality laws including: the monitoring of air pollution; reporting to the Commission; and keeping secret ministerial briefings relating to legal action. “This decision reminds us of the scandal of Mayor Johnson’s backwards steps on air quality and inaction by the so-called ‘greenest Government’. CAL urges a simultaneous twin track approach to address this public health crisis: rapidly escalating legal action if either of the PM10 limit values is breached in London in 2011 (as already looks likely); and radical action by the Mayor and Government. CAL will be looking closely to see whether the UK complies with the strict conditions of the exemption. “CAL thanks Commissioner Potočnik and his colleagues for the great care they have taken in reaching this decision and recognises that the Commission will have felt obliged to accept the UK’s representations at face value. CAL also wishes to thank its supporters for the valuable part they have played in today’s successful outcome. I would like to thank particularly: Darren Johnson AM and Jean Lambert MEP (Green); Lord Berkeley, Ken Livingstone, Claude Moraes MEP and Murad Qureshi AM; Sarah Ludford MEP and Mike Tuffrey AM (Liberal Democrat); and the Campaign for Better Transport, ClientEarth, Environmental Protection UK, Friends of the Earth and the London Forum of Amenity and Civic Societies. “Separately, we should not forget that the nitrogen dioxide (NO2) annual mean and hourly limit values, which entered into force on 1 January 2010, were breached by a factor of two near London’s busiest streets last year. The hourly limit value for the whole of 2011 was breached early in January. 1 January 2005 EU limit values for PM10 enter into force. 11 June 2008 EU directive on ambient air quality and cleaner air for Europe enters into force. 29 January 2009 European Commission sends UK first written warning over PM10 breaches. 3 June 2010 European Commission sends UK final written warning over PM10 breaches. Mayor estimates 4,267 (and up to 7,965) premature deaths in London in 2008 were attributable to long-term exposure to dangerous airborne particles (PM2.5). The Mayor’s health study included estimates for each of over 600 Wards across London. BBC reported on 5 December 2002 a Department of Health estimate that 4,075 more people had died during the Great Smog of December 1952 than would have been expected under normal conditions. COMEAP published their report titled ‘The Mortality Effects of Long-Term exposure to Particulate Air Pollution in the UK’ on 21 December 2010. See paragraph 21 on page 5 of main report for estimates of impact (i.e. up to 11 ½ years each and speculating that air pollution may contribute in some smaller way to the premature deaths of up to one in three people nationally).